This peak is #71 in Prominence List for British Columbia .Located about 10 km north of the head of Stave Lake, and just west of the Stave River. 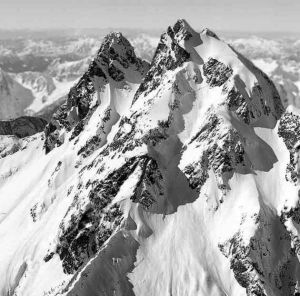 The distinctive dark twin summits are visible to the east from just about any of the local north shore peaks around Vancouver, including The Lions, Hollyburn, Coquitlam Mountain, Golden Ears, and Robie Reid. The approach is a multi-modal approach requiring a canoe to get up the lake, then some form of transport to get up the road, then a challenging ford of the Stave River, and then the glorious vertical bush of the lower climb. All in all, a climb of over 2000 meters starting from only about 100 m above sea level. The bush is filled with cliff bands and rock outcroppings, and tales of disaster and failure are easy to obtain. Name Notes: Judge Frederick William Howay was one of the pre-eminent historians of British Columbia, and his personal collection of maps and documents is an important part of the holdings of the University of British Columbia. His historical writings are major sources for BC history. Born in Ontario in 1867, his family moved to BC in 1870; in 1885 he and his friend Robie L. Reid would be the only two to graduate from the new provincial examination for a permanent First Class teaching certificate. He and Reid studied law together at Dalhousie, graduating in 1890; both returned to establish their own law firm in New Westminster in 1893. In 1907 Howay was appointed Judge of the County Court of New Westminster, a post he held until 1937. He died in 1943.